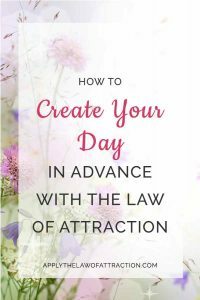 It's easy to create your day in advance with the Law of Attraction. All it takes is an understanding that within you lies a great power. It's in every cell in your body…every breath you take. This power creates the world around you, the very Universe itself. When you know how to use this power, you'll easily write your perfect day ahead of time. The Law of Attraction makes it so. The key to this power is deciding what you want, relaxing and allowing it to be. Decide that you want your commute to work to be easy. Let the power make it happen. Simply relax and allow it to be. Decide that your shopping trip with be pleasant, relax and allow it to be. Decide that your relationship will be warm and loving. The power will create it when you relax and allow it to be. That's really all there is to creating your day in advance with the Law of Attraction. When you first open your eyes in the morning, you begin to shape your day. So while you're still lying in bed, begin to create your day in advance. Decide everything you want to have happen. Imagine that it already is. Feel it as if it's real. If you want a job offer, feel the joy and relief that you would feel as if you already received the offer. Feel it now. If you want a pleasant conversation with your children, feel what you would feel once the conversation took place. Each thought you have, each feeling you experience is creating your day in advance with the Law of Attraction. You are moving towards your desires. When you first start to design your day in advance with the Law of Attraction, there may be some things that don't go the way you wanted them to. You can't control everything that happens, but you can control your reaction. Accept that this is a process. You are getting closer and closer to your perfect day. You are taking action and it's the action that separates you from others. The action of creating your day in advance will make changes in your life. Most importantly, each time you create your day in advance, you change your thoughts to positive intentions that cause a positive response from the Law of Attraction. Even if it doesn't seem like you're immediately creating your perfect day with the Law of Attraction, each time you write your day ahead of time, you activate the power within you and send out signals that produce the changes you wish to see. As you go through your day, the more you replace negativity (negative thoughts, the news, complaints by co-workers, etc.) with inspiration, motivation, and positivity, the more you will see everything you want to create for your day, actually occur. Don't feel like you have to rush things. Begin creating your day in advance by writing down how you want your day to go before you get out of bed. Slowly start building the positivity throughout your day. There's no need to rush things and try to be perfect all at once. Go at your own pace. Grow with the process. Whenever you find yourself rushing and hurrying, take a deep breath. Know that those actions are based in fear and worry. Take a few moments to shift your vibration. Listen to music. Pause and look at the world around you. Do something that grounds you and reminds you of the power within you to create Universes. Remind yourself how you want things to go. Relax and allow it to happen. Before you know it, every day you create in advance with the Law of Attraction will be your perfect day. If you are doing day to day manifesting does that change your big goal or is it part of making the bigger goal? If I am doing day to day but have a bigger goal I’m working on, am I helping reach the bigger goal or am does it take away from the big goal (they are related)?